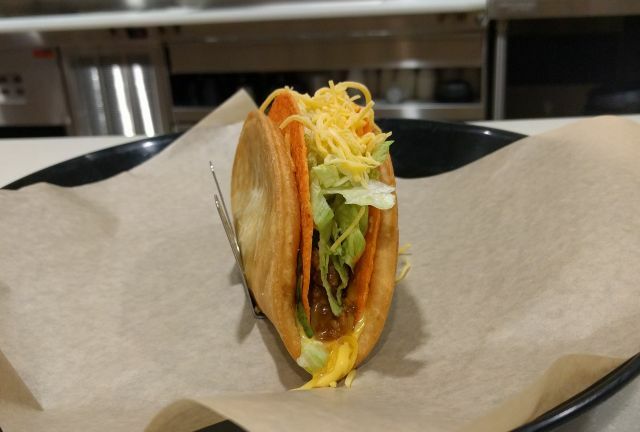 On a recent visit to Taco Bell headquarters in Irvine, CA, I was able to try a number of new items that they will be testing out in the wild starting today. The items I sampled included the Doritos Quesalupa Crunch, Chicken Enchilada Burrito, and Caesar Crunchwrap. 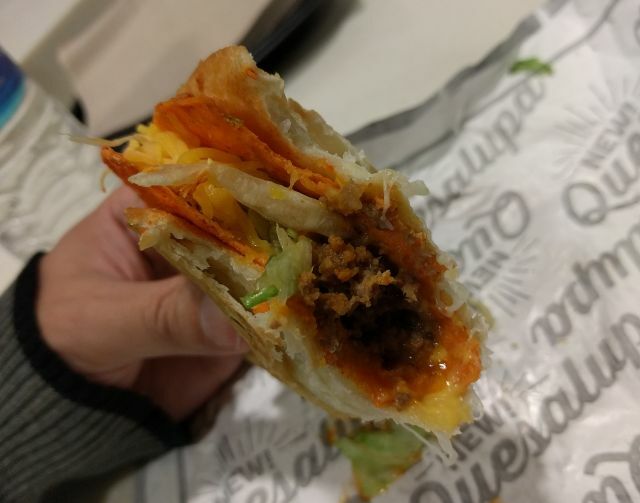 - Doritos Quesalupa Crunch - This is basically the Doritos Cheesy Gordita Crunch but with a Quesalupa shell taking the place of the gordita flatbread. 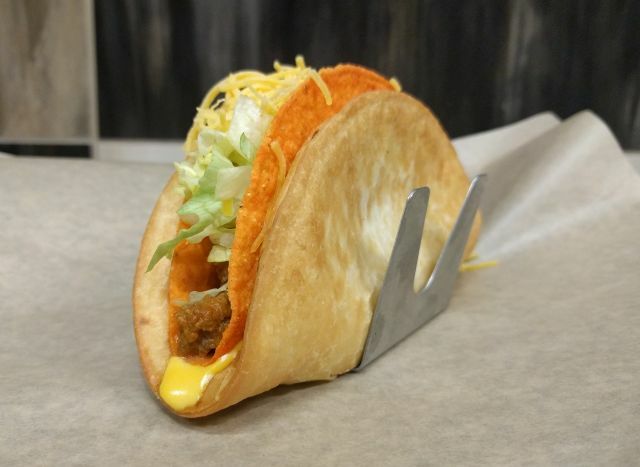 If you're a fan of the Doritos Locos Taco or the Quesalupa, you're probably going to love a Doritos Locos Taco in a Quesalupa. I liked this one a lot. It was my favorite of the three. The crisped, cheesy shell of the Quesalupa goes really well with the powdered, cheesy crunch of the Nacho Cheese Doritos taco shell. The layer of nacho cheese between the two shells (plus the shredded cheese of the filling), makes the whole thing a gloriously cheesy experience. 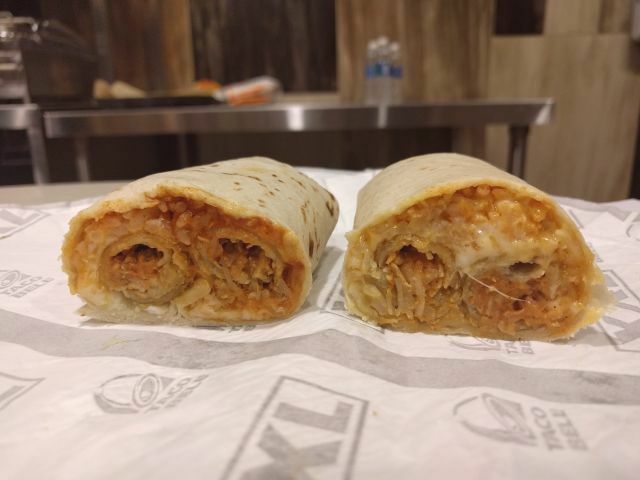 - Chicken Enchilada Burrito - So, yes: Two Rolled Chicken Tacos (taquitos), rice, red sauce, cheese, and sour cream rolled up in flour tortilla does indeed taste like an enchilada. You can also get it with nacho cheese instead of red sauce, which is a little less enchilada like but still enjoyable enough. The Rolled Chicken Tacos give it a nice crunch but there's not all that much chicken to go around and between the rice, flour tortilla, and taquito shells, it's pretty carb heavy. 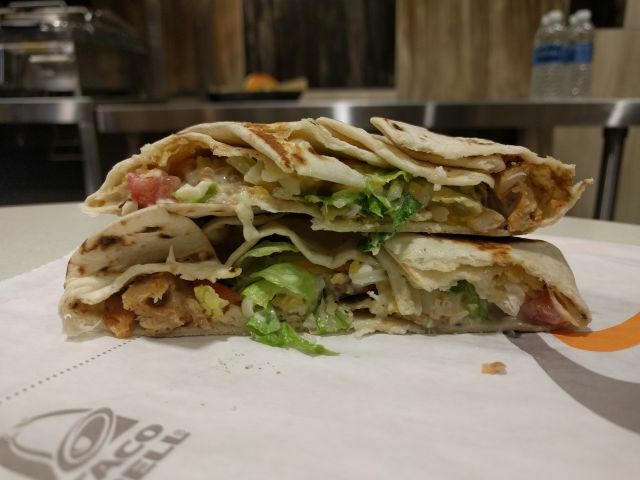 - The Caesar Crunchwrap felt like a lighter, salad version of the Crunchwrap Supreme, which seems to be the goal. While the other two items don't actually feature any new ingredients, here there's the new Caesar dressing and new parmesan crisps. 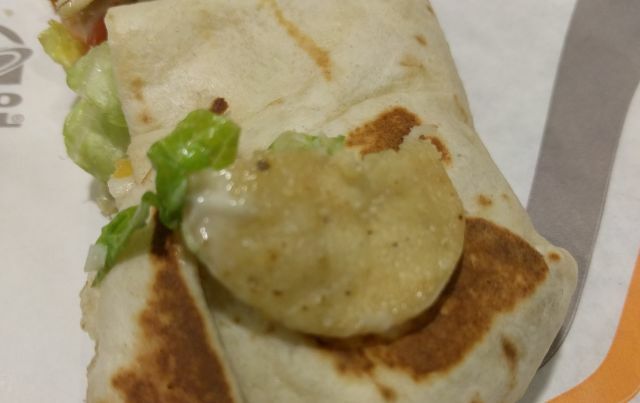 Also, unlike the original Crunchwrap Supreme, they go with Romaine lettuce rather than iceberg. The Caesar dressing offered the expected creamy and tangy profile but also delivered an unexpected spicy kick from roasted green chilies. The heat was fairly mild but noticeable. The parmesan crisps look, feel, and taste a lot like Taco Bell's tortilla chips, except they're round and have a mild parmesan flavor to them. I could have used a few more of them for crunch. They let us sample the chicken version, which fits the Caesar salad theme well but it's also available with steak. I was a big fan of the Chicken Caesar Grilled Stuft Burrito back in the day, so I'd definitely pick one of these up if they make it out of test.